At 300 kilometres south west of Alice Springs, with the first 130 kilometres south along the sealed Stuart Highway and then 170 kilometres west , at the end of the unsealed Ernest Giles Road, lies Watarrka or Kings Canyon National Park, one of the most spectacular sites in the Central Australian outback. 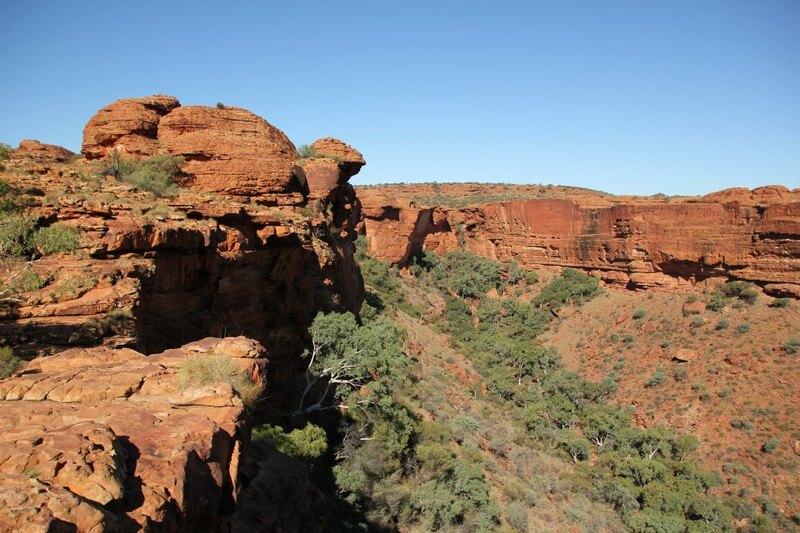 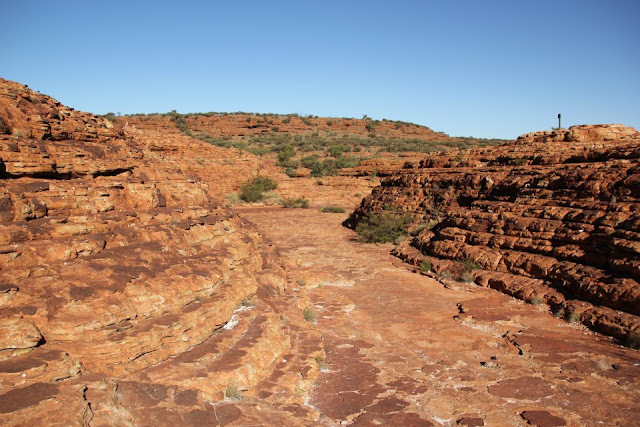 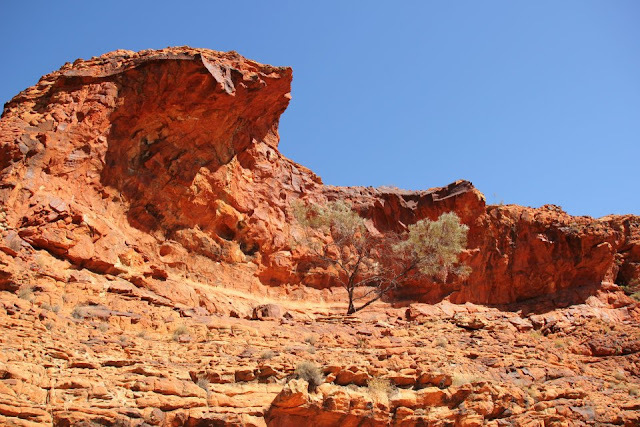 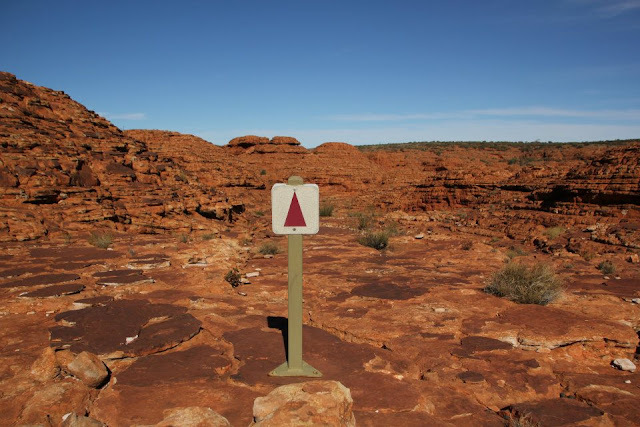 Kings Canyon offers sights unlike any other in the Northern Territory. 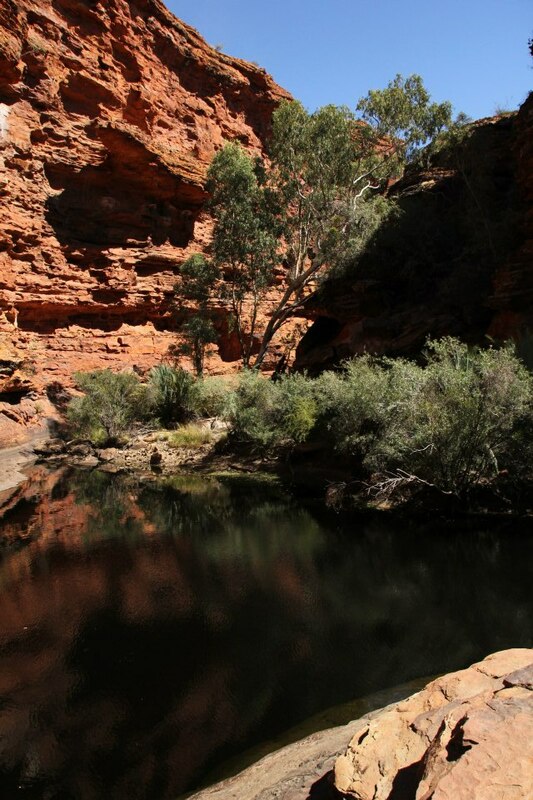 It was the explorer Ernest Giles and his party who found water here during their expedition in 1872; it saved their lives. 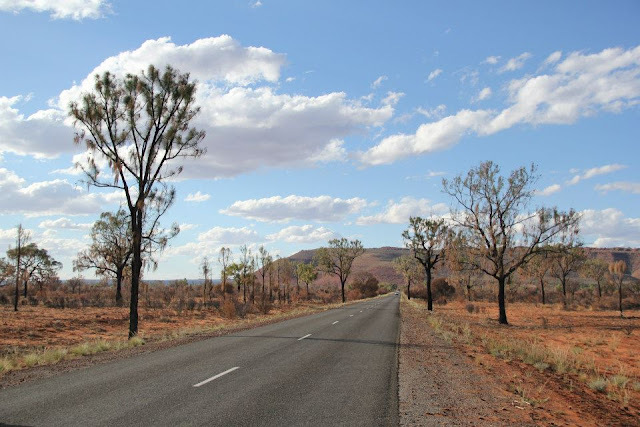 The gravel road that runs between Watarrka and the Stuart Highway bears his name. 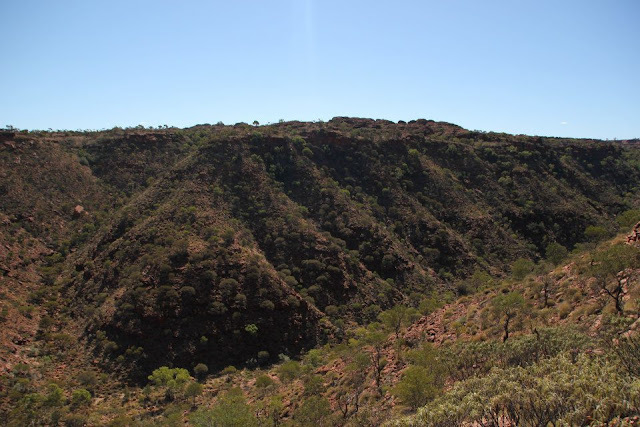 13 kilometres before the turn off is Henbury Meteorite Craters Conservation Reserve: here, 4,700 years ago, a meteor, travelling at around 40,000 kilometres per hour and weighing several tonnes disintegrated before impact and formed at least 12 craters here. The largest of these craters is about 180 metres across and 15 metres deep. 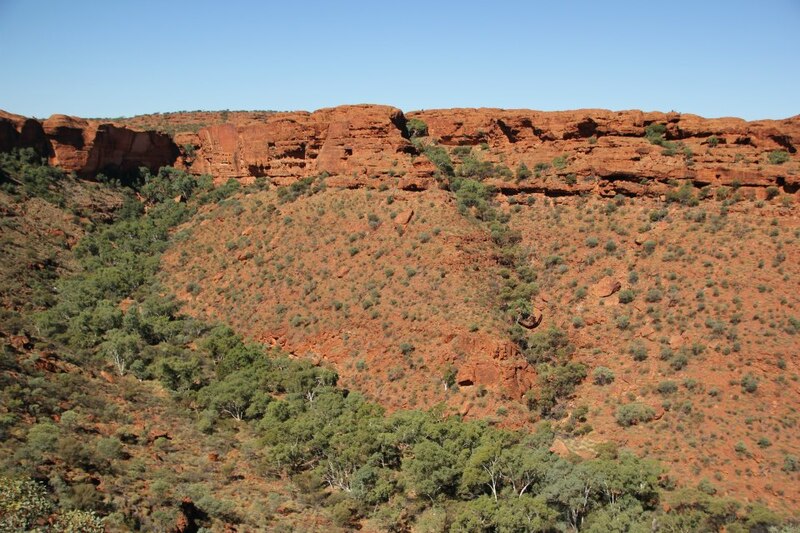 Rock fragments have been found and turned out to be mainly metallic: one of these was the size of a football and weighed an incredible 46 kg! 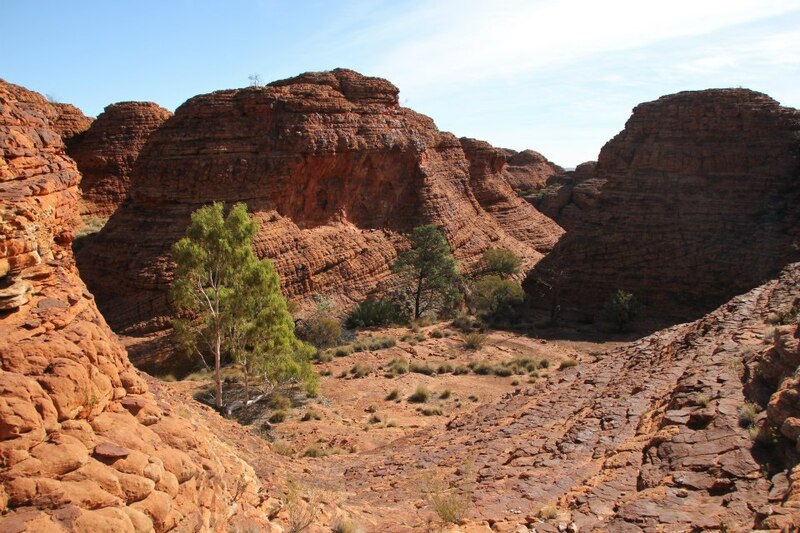 Kings Canyon was my refuge, I found this gigantic place, fascinating and above all magnificent. 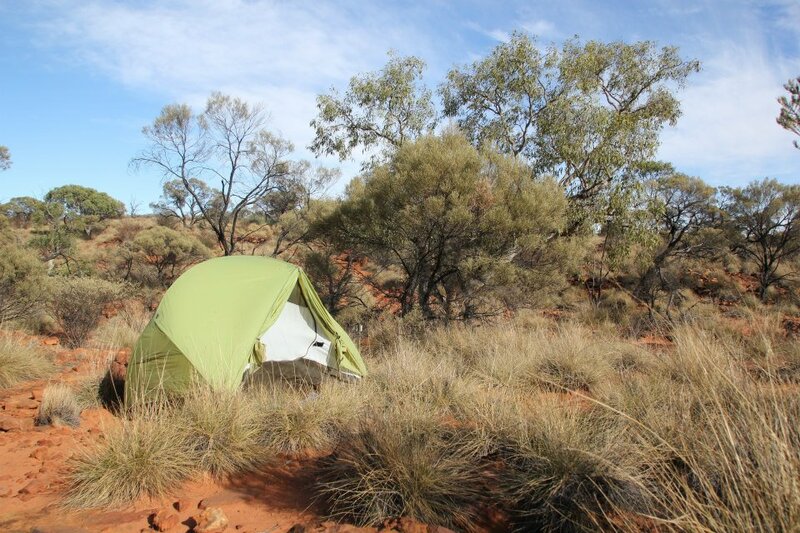 I marveled every moment, not surprising after having spend the last few weeks in a flat desert. I spent two days exploring the labyrinths of domes from various angles and views and enjoyed myself to meditate in the Garden of Eden and near the Ghost Gums with extensive views. It is set in the George Gill Range and must have evolved over millions of years. 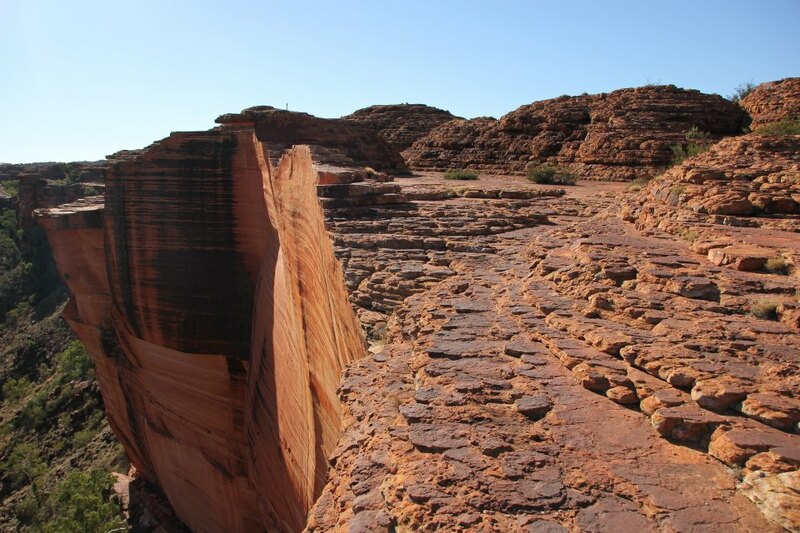 Over those epochs cracks appeared in the sandstone and as this fractured, huge boulders fell into ravines, eventually weathering to beehive shaped domes, now called the Lost City. Eventually a valley with vertical sandstone cliffs, 100 metres high, was formed; the porous sandstone collects water and slowly filters it through to the bottom of the ravine, where many plants and animals flourish. 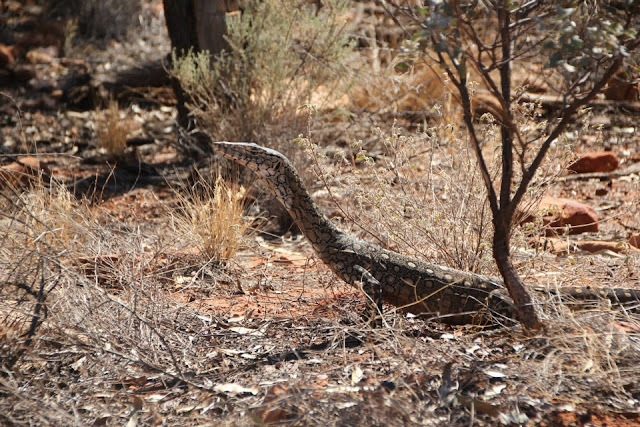 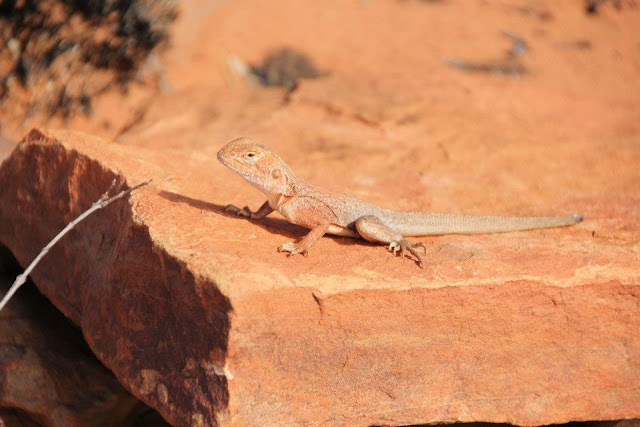 There are many reptiles here, from the large desert perentie to small skinks and around the waterholes, with its yabbies (small shrimps) there are many birds. The Luritja Aboriginal people, who have lived in the region for over 20,000 years, are the traditional custodians of the park and have a strong voice in its management; they also operate tours that show aspects of their culture. 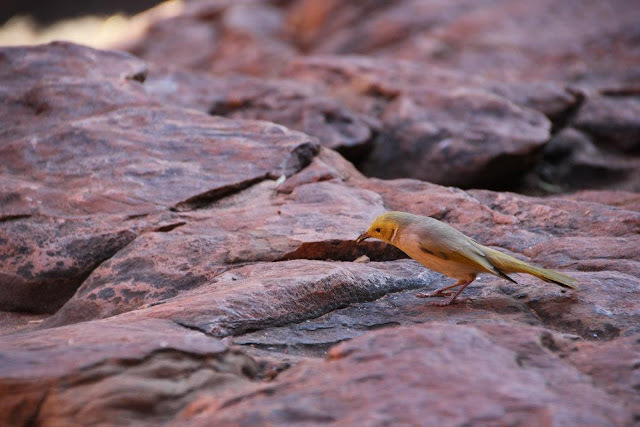 The name "Watarrka" in their language stands for a species of acacia. 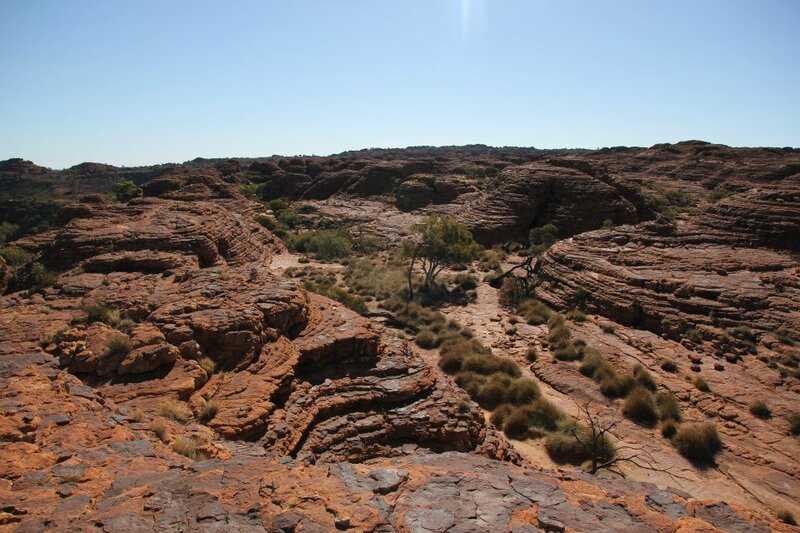 The park includes a range of environments: there are permanent springs with ferns and cycads, living fossils; there are red sandhills covered by desert oaks and spinifex grass; but its most spectacular feature are those sandstone canyon walls, especially when they are lit by low sun at dawn and dusk. And there are great views from the canyon rim over the weathered rocks of "The Lost City" and the waterholes and lush vegetation of the "Garden of Eden", with its palms, ferns and ancient cycads. 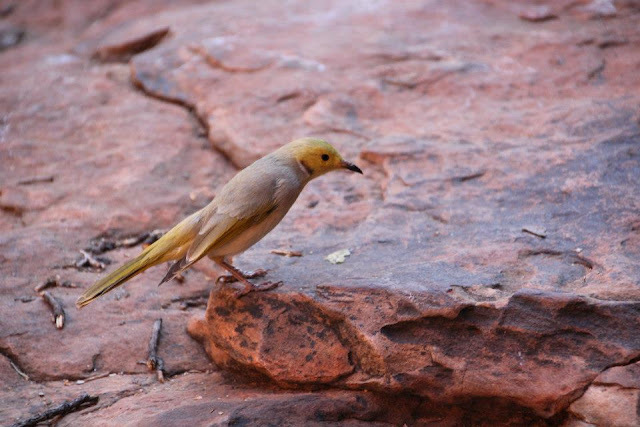 White-plumed Honeyeater (Lichenostomus penicillatus) -The White-plumed Honeyeater feeds very actively from leaves and flowers in the crowns of trees and in shrubs between 5 m and 13 m from the ground. Its main foods are nectar, insects (and their products such as lerps and honeydew), manna and fruit, with some seeds. Very strongly associated with River Red Gums. They sometimes also feed in the air or forage upon the ground. 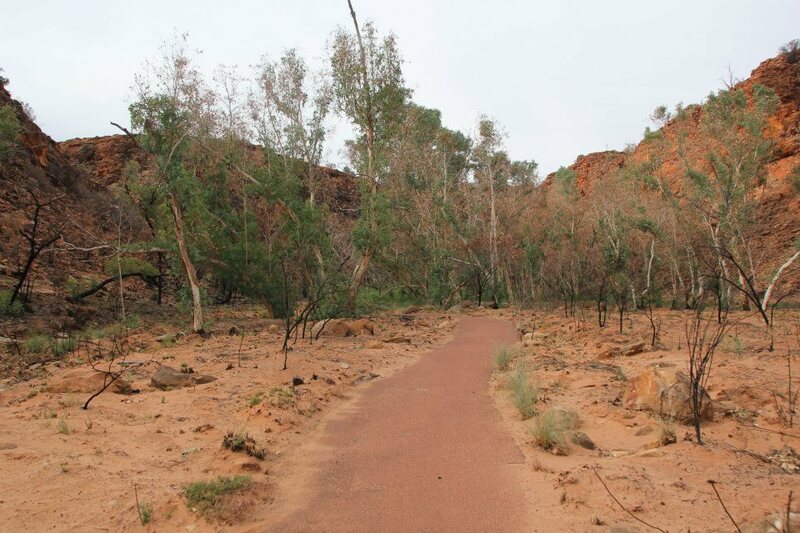 Giles track was fantastic, there was a forest fire some time before, so I can see the beautiful leaves repel making really pretty trees. unfortunately, I didn't take enough water, the second day, I miss water for cooking but especially for drink. 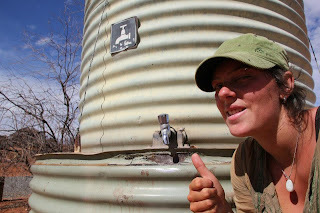 Then I walked a little faster at the end to reach the water tank has Kathleen Springs. 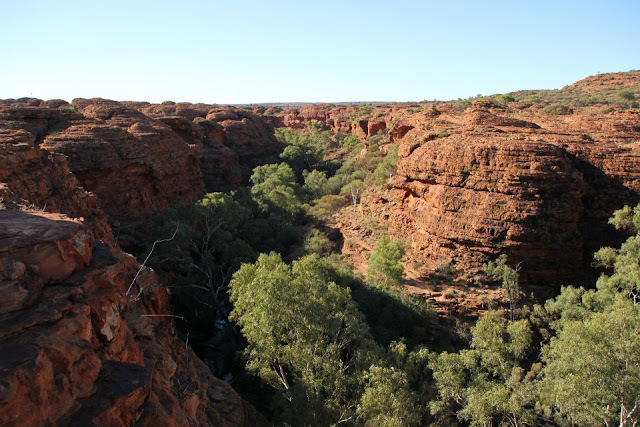 About 20 km south of Kings Canyon in Watarrka National Park in Australia's Northern Territory are in the Kathleen Gorge, the Kathleen Springs. 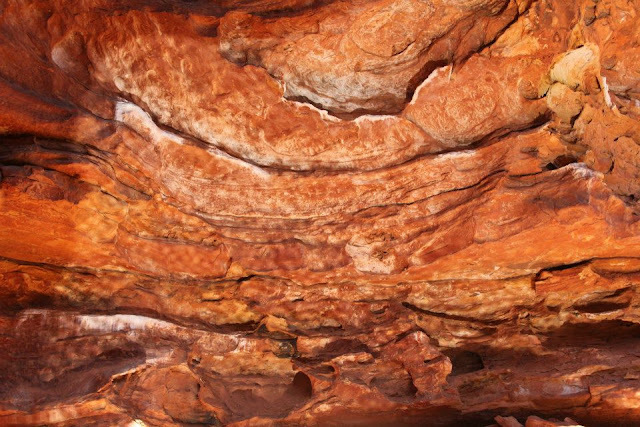 There are sources that are for people living there to this day of great importance. The sources had a spiritual significance for the Aboriginal people of the Luritja because of their Dreamtime mythology, the rainbow snake lives in the water holes. 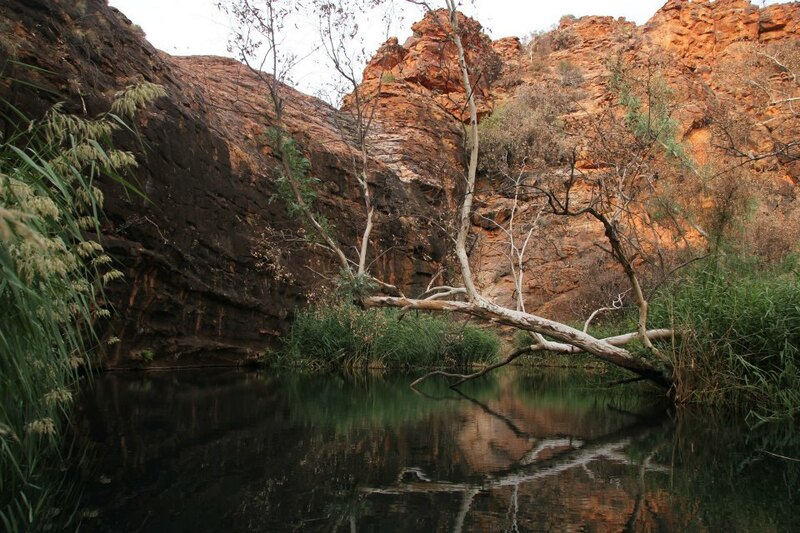 As in the canyon water is constantly available, pulled to the unceasing waterhole Animals that could be hunt by the Aborigines with spears. The sources were the reason for conflicts of whites and Aborigines because white settlers, they used to water cattle and thus encroached on the lifestyle of the aborigines. 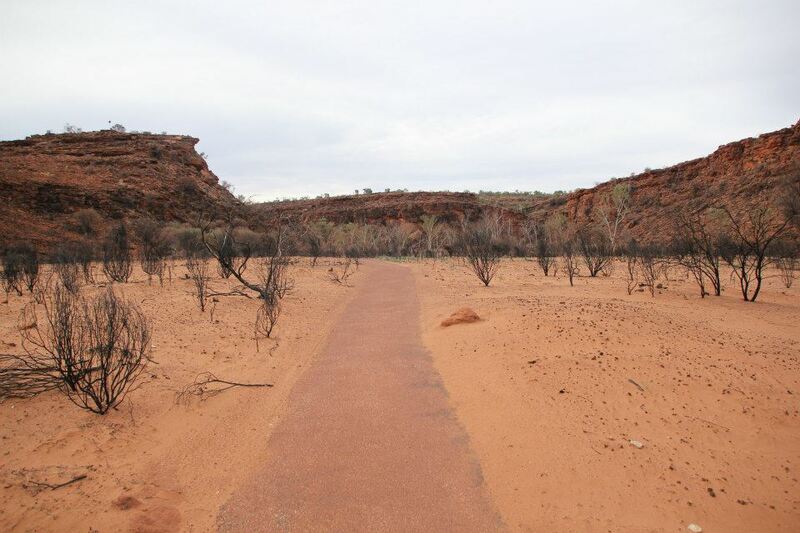 The Aborigines in turn stole and ate many of the white cattle cattleman. 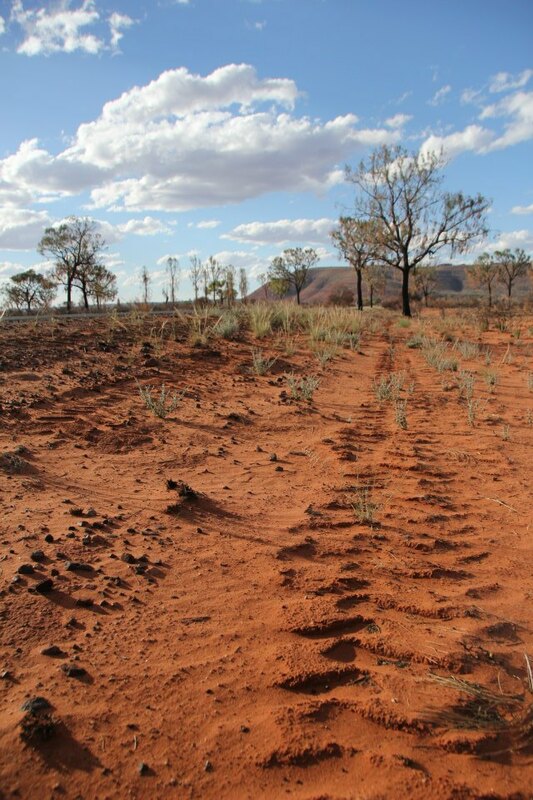 The police arrested the cattle thieves and put them firmly. Invigorates with Watarrka National Park, I am ready to go to Alice Springs. 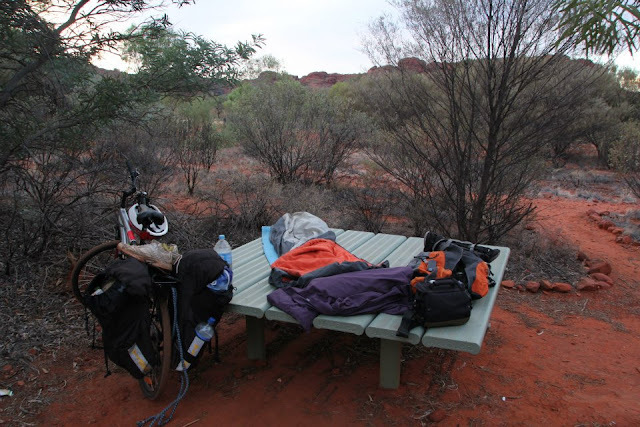 missing screws for my rear rack, I go there by hitchhike.